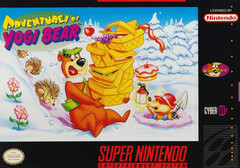 Adventures of Yogi Bear for Super Nintendo features Yogi's efforts to prevent a chemical plant from being built in Jellystone Park. Play through five areas of the park while searching for picnic baskets. Beware of evil skunks and other enemies that will try to send you into early hibernation. There are also fun things along the way such as crazy beaver surfing and riding in a mine cart as you attempt to thwart the destruction of your home. The Adventures of Yogi Bear is suitable for all ages.